The healthcare industry uses patient wipes, housekeeping wipes, and medical wipes by the bundles. Wouldn’t it be great if you could take care of all of these needs with one healthcare wipe? Oh, wait – you can! OMNIWIPES are developed especially for use in the healthcare industry. OMNIWIPES are made of thick, heavy-duty spunlace fabric that works well as aged care wipers or childcare towels. Available in bundles of 50 white cloths per packet, OMNIWIPES are soft enough to not scratch delicate skin, but also strong enough to scrub up a mess. Add these to your childcare cleaning supplies or as a disposable towel in the kitchen of your aged care facility. You need a wiper that is hygienic but adaptable. OMNIWIPES have a 90% viscosity rating, meaning that they will absorb just about anything that is in the least bit non-solid. Don’t you hate trying to wipe jello off of the face of a toddler? It’s even worse if it makes it to the floor, or smeared on the table top. OMNIWIPES grip even semi-solids – whether they are food or former food – and contains the goop until you can get it to the garbage. Even better, it doesn’t drip, so you won’t make a bigger mess trying to clean up the original disaster. You can use OMNIWIPES against skin to clean up patients in your aged care facility, or in the playroom at the daycare. These are low lint wipers so they can be used to shine mirrors and windows or clean medical equipment. Give OMNIWIPES a try, and you’ll order them every time! 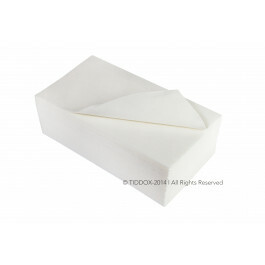 Other related products from TIDDOX's healthcare range of cleaning wipes are the MAXI WIPES, the WHITE RHINO ROLLS, and the ULTRA SOFT POLYSOFT CLOTHS.